I have surfed Lennox Point with B Green on his belly boards. Used to be a few at Kingscliff when I was first learning to surf. Some of the crew had homemade ones out of ply with cupboard handles on them. Always looked particularly lethal. I've been riding bellyboards since 2004, initially due to back problems but in more recent years through preference. They are all 4'6 (0.77 of my height). You don't want to go too long proportionate to your body. Rod's page http://mypaipoboards.org is a rich source of ideas. I've ridden a variety of other finned (including a 5 finned bonzer BB) to finless fibreglass or wood boards. A basic twin fin design is a good all-round board. As Steve noted his homebreak is a great spot to ride these type of boards (haven't seen you out on my last few surfs there but crowds seem to be down generally) as is just about anywhere else. Weak walls with low power aren't the ideal waves for the boards. There is a learning curve, but it has kept me in the water and having more fun than ever. Digger, the type of injury could be a factor on board length or the degree of flotation you desire. For kick paddling (swim fins), if you lay directly on the board and leg kick paddle then you want to be sure of enough knee clearance. Others, especially neutral buoyancy types (such as less than 1 inch wood boards), paddle for a wave with the board extended out in front of them and then pull themselves onto the board. My rule of thumb is a board no taller than the bottom of my sternum (the line between your chest and stomach). I am 5'10" and ride a 50 inch board. My preference is for a board width between 19-3/4 to 20-1/2 inches. I generally use thickness volume for harder to catch wave breaks and thinner boards for easier to catch waves--both of these are generally late take-offs. Volume/float is generally 2-1/2 inches with volume from the stringer to the rail; thinner boards for me are around 1-7/8 inches dome thickness at the stringer tapering off towards the rail. The bonzer is the "S&S Diamond Bonzer RPM." 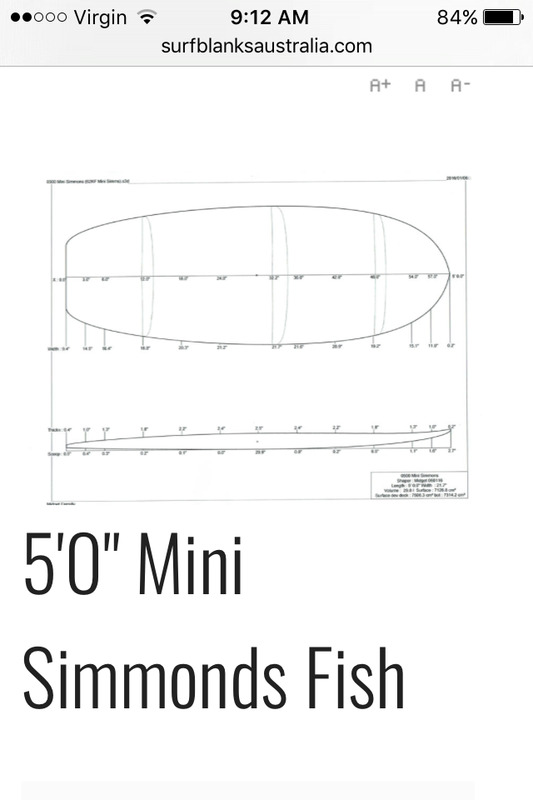 Going to the page will show a series of fins used and a link to my sea trials with various fin sizes and types. Since obtaining a second pair of small bonzer runners I have stayed with that arrangement. Just joined the forum, spending my time trying to find stuff on fibreglass rails and rockers. I’m thinking 2” on nose and 1 “ on tail ? Of course, different strokes for different folks. It will largely depend upon your surfing style on the board, your surfing style in general and the kinds of waves you ride. You'll get a wide range of opinions and advice on the paipo forums. There is an argument for keeping it simple the first time around. Bonzer fin placement is something of an art. You may also find the bonzer needs a bit of power to get going. I've only ridden it finless so far. As Rod says, different strokes. Been reading and researching. I just can’t resist making a few bonzers. 3 fin only though, 4 inch centre and small custom triangle side bites. I’m not sure if I will ever get in the water again as the fear of hurting my back again is very debilitating and I do live in real fear of lifting any heavy weights. Maybe once I make the bellys I might test em out. I’m in tassie on the west coast now, my local is trial harbour so the wave won’t be lacking for power, the main problem is waiting for calm enough conditions as it’s nuts in winter with size and water movement. Plus never seen people out there yet even when it’s good, so empty at all times basically unless you fluke it. Digger, I ride my board forward rather than from the rear of the board. As such, I favor soft rails in the forward third of the board so I don't suffer rail digs on turns and releases. Turned down rails or sharp rails tend to do that... my rear two-thirds rails are turned down, my final third more so. On canting the sidebites, it sounds like you are going with glass-on fins. If not, I would suggest evenly spaced FCS plugs you can experiment with fin position, forward and after. You can obtain canted FCS fin boxes to do initial fin experimentation before committing to more expensive canted bonzer fins. For experimentation one can use various forms of FCS single-plug fins (e.g., knubster style and more traditional fin shapes in a smaller form around 2" tall, in either single or twin plug versions). Unless you feel comfortable glassing, removing and reglassing bonzer runners. I find it much easier to experiment with FCS fin plugs which I did to nail down my Bonzer board fin selection and arrangement.